Source: Marcy Criner is the creator of Horses of Us, an equine artist, and a follower of horse wisdom. This story is one of the inspiring posts on www.horseconscious.com. One flick of the finger turns the barn from a soft dreamy darkness to bright glaring light. In a flash, our mood and tenor shifts to the urgency of birth. From her black hindquarters, we see a translucent sac covering two hoofs quickly emerge. Aspen is standing then chooses the lay down with a graceful thump. We see the baby’s nose between its feet. Another choice is made and Aspen is up again. Taking a moment to think she moves then decides to go back down. Once she is down, I find myself on the ground covered in fluids with the baby’s nose in my hands. I pull the white slick sac away from his nose and hear him take his first breath. Another push and the baby is out. A rush of welcoming whinnies and neighs fills the space. 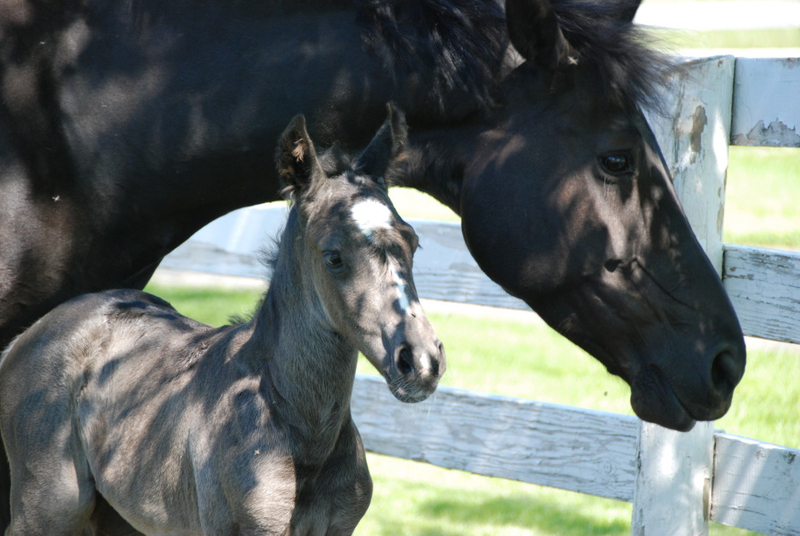 This strong black colt is still linked to his mother through the umbilical cord. I begin to stroke him feeling his warm body below me. Aspen turns her regal head and stares at him with a look of adoration. A deep neigh emanates from her. His long legs are moving as if to say he wants up! I continue to touch him as we wait for his mother to rise. Before me I see all legs ready to run, hop, and explore the world. I feel nothing but shear appreciation. Appreciation that I am a witness to the essence of life. Seeing life in its purest form. I feel the aliveness in me as I stand with Martin and watch Aspen rise, as her baby knows he will follow. He struggles and falls all the while being encouraged by his mother. I feel a deep knowing well-up inside me. From this place, I am connected to a greater universe. This is it. In this moment the curtain pulled back and a feeling of life force called me in. All four feet were planted on the ground. He is standing! Waves of wonder flow though me and he starts experimenting with his newly discovered legs. Falling and twisting he tumbles. As quick as he falls, he is back up on his feet. Martin and I see milestones like nursing come and go. I wonder about transformation and think of this newborn foal. I see myself in him. In twenty minutes, he transformed himself from one world to the next. Thoughts of mental states and our ability to transform them flood my mind. A quiet stillness settles in for the night as early morning approaches. With a full belly, the newborn colt, Flutter, begins his peaceful sleep. We are mesmerized by the simple, perfect beauty that life brings to those in the dark or in the light. In stillness or in fits of urgency, the ability to move to the essence, to feel the source of all things is the gift within. That moment of pure presence opened my heart to true joy that quiet night in May. A wonderful video I thought you would all enjoy. Horses keep an eye on people, a very keen and knowing eye. In Equine Behavior we are going to learn how to keep an eye on horses. Together, we shall come to see the world as horses see the world, and with that we will improve our ability to develop willing partnerships with horses. By appreciating horses’ long evolved nature as social grazers of the plains and group survivalists, we can more readily and consistently keep horses happy, healthy, and willing to learn. In a sense, we will learn how to become part of their herd. We begin our equine behavior education journey unknowing what awaits us, much as horses began their journey through time 60 million years ago. Three million years ago the footsteps of man were fossilized next to the hoofprints of horses in what is now Kenya, suggesting that humans have been contemplating horses for some time. But it was not until perhaps ten to twenty thousand years ago that man began the dance of domestication with horse, the horse who became Equus caballus. There is archeological evidence that man formed a close relationship with horses by 5500 years ago in Botai, Khazakstan where the horsefolk kept and milked horses, probably rode them, this after millenia of hunting horses for food. Both trained and wild horses co-existed in this realm south of Russia and west of China. Trained horses soon spread throughout the world, civilization of man the result. By the early 20th century the predecessor to man’s newest animal partner, the tarpan, had gone extinct. No truly wild horses remain, excepting perhaps the Przewalski, which has a different number of chromosomes than the horse, and is not thought to be horse’s progenitor. To the best of our knowledge, all horses today are descended from tamed and selectively bred horses. The progenitor of the horse, the tarpan Equus ferus, went missing from our planet in 1918. One gauge of domestication is the extinction of the progenitor, and mankind has managed that. The horse of today is with us to stay, it seems, and can live with humans, or without them. I just had to share this incredible video with you! Honza Blaha is such an inspiration as he combines Natural Horsemanship together with the equestrian sport. Make time to watch this beautiful video and be amazed at Honza’s relationship with his horses!